Toddlers love all kinds of imaginary games and pretend play, and what better way to encourage them than to provide them with some of the best dinosaur toys for 3 year olds and up! Your child is at the stage where they love making up their own stories and adventures and need toys that will encourage and help them. With that in mind, we’ve handpicked some amazing dinosaur toys for toddlers that will keep them engage for hours on end in happy, fun, creative play. Have a look and see if you can find the perfect gift for your three year old, especially if they love dinosaurs as much as we do! This set of Pretex Realistic Looking Dinosaurs comes in a set of 12 and includes one each of Monoclonius, Allosaurus, Pachycepholosaurus, Corythosaurus, Bayonynx, Spinosaurus, T-Rex, Stegosaurus, Triceratops, Apatosaurus Ankylosaurus, and Diplodocus. The set also comes with a Dinosaur Book with pictures and facts about each of the different dinosaurs included and each dinosaur stands up on their own. Designed for children ages 2 years and up, it’s perfect for children age 3 who are interested in dinosaurs and love playing with them, creating their own imaginary games and adventures. These dinosaurs are made from a solid rubbery material which makes them great toys for playing in the sand box, kiddie pool, bathtub, or on the floor. The accompanying dinosaur book has a full page about each dinosaur, giving different facts as to the size of the dinosaur and other interesting pieces of information that small children want to know. 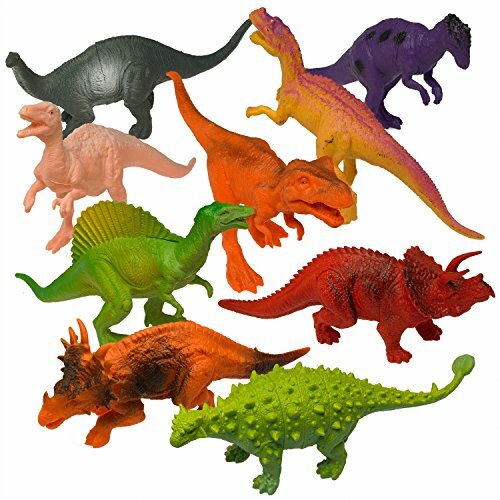 These dinosaurs are colorful and are 7 inches long or shorter, making them a great size for imaginative play. There are enough dinosaurs in this set so that your child can play with one or two other siblings or friends. Parents shared that their little ones use these dinosaurs to terrorize toy soldiers and other figurines when engaging in imaginative play! The Pretext Realistic Looking 7 Inch Dinosaurs makes a great toy for any child who loves dinosaurs and wants to learn more about them. Great fun for small children to play! If you have a child that loves both cars and dinosaurs and are looking for the perfect gift for them, then check out this Set of 3 Bees and Me Dinosaur Toys. 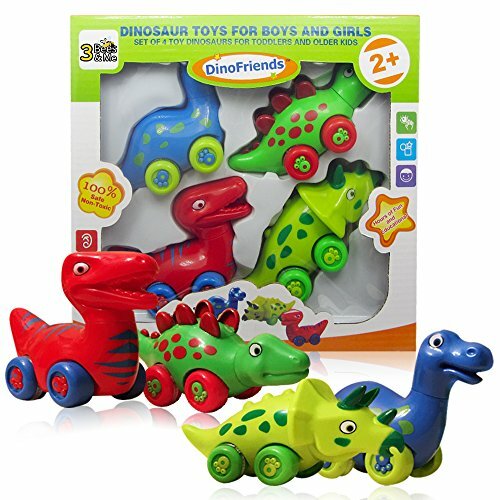 There are 4 dinosaurs on wheels that come in this set, and these dinosaurs come in bright primary colors of red, blue and green. The dinosaur figures themselves represent are the Brontosaurus, Stegosaurus, Triceratops and T-Rex and the dinosaur cars roll easily, All your toddler has to do is push them forward to wind the wheels up and they go. Each dinosaur is 5 to 6 inches long and their necks turn which your 3 year old will love. These dinosaurs are BPA, lead, and Phthalate Free and designed for children ages 2 years and up, so the perfect gift for your toddler. These dinosaur toys are great fun for kids who use them both for dinosaurs or for cars, and add a touch of imaginative play to those fun car races with siblings or friends during play dates. Parents really like that these are simple toys that bring their children a lot of pleasure and encourage them to use their creativity when playing. Small children simply like that these dinosaurs are cute and friendly looking and roll easily. These cute little dinosaur cars are perfect for any child who loves dinosaurs and cars by combining the two together in 4 cute little toys. Will provide your little one with hours of fun play! 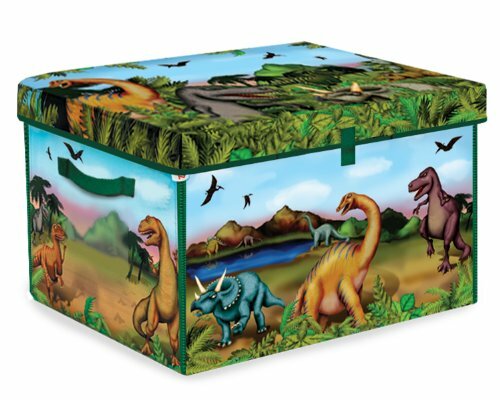 The Zipbin Dinosaur Collector Toy Box with 2 Dinosaurs is a convertible toy box that zips open and converts into a play mat, perfect for your child’s toy dinosaurs. While the box is supposed to hold 160 dinosaurs, the actual amount of dinosaurs it holds will depend on the size of the ones you store in it. The box is best suited for dinosaurs that are between 2 and 5 inches. Zipped up, the toy box makes a cute dinosaur themed storage box with handles, and it’s perfect for storing or carrying dinosaurs. When your child wants to play, they can simply unzip the box and the box folds open to a forest or jungle suitable to be inhabited by your child’s dinosaurs. The toy box comes with 2 bonus dinosaurs to get your child’s dinosaur collection off to a good start. Parents like that this toy box has a double use, and kids love the fact that they have their own little world for their dinosaurs to inhabit, and then when they have finished playing, a safe place to keep all of their dinosaurs together. This Zipbin Dinosaur box and play mat will be a hit both with toddlers who love dinosaurs and parents alike. This convertible toy box with 2 dinosaurs offers your three year old hours of fun play! Children love toys that encourage imaginative play and this VTech Switch and Go Dinosaur ‘Blister’ the Velociraptor Dinosaur is a great imaginative toy. 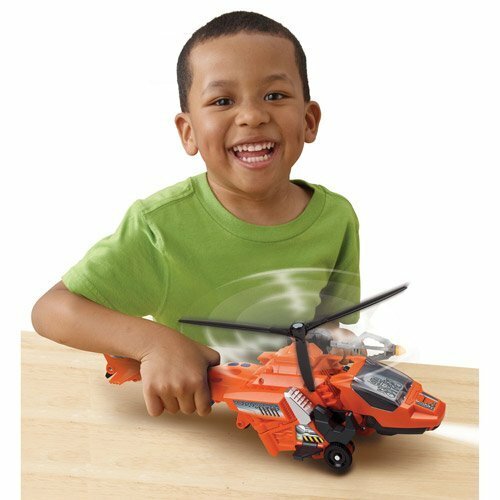 This transforming toy switches from a helicopter to a toy dinosaur and back again and makes both helicopter and dinosaur sounds! And in both forms, this toy launches a toy rocket. How cool is that! Pressing the button will make the helicopters propeller spin and it has its very own search light. Plus it has over 70 different sounds and phrases. The dinosaur is designed for children ages 3 to 6 and has a volume control switch. It requires 2 AA batteries (included). 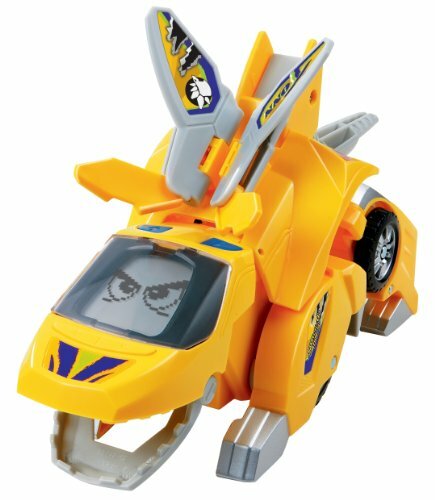 Your child will have great fun playing with this transforming toy both as a helicopter or a dinosaur or as both during one play session. When something bad happens, the rescue helicopter will quickly fly to the location and then the dinosaur will take over and help defend those in need. They can also have dinosaur battles with other siblings or friends who have their own switch and go dinosaurs. This dinosaur is a fun toy on its own but you can add to your child’s playtime fun with other other Switch and Go Dinos. Children find this dinosaur/helicopter fun to play with in both forms! The Fisher Price Imaginext Ultra T-Rex is one huge dinosaur that offers hour upon hour of fun for your 3 year old child. This dinosaur comes equipped with 3 power pads that make the T-Rex walk, makes him stand tall (at 2 ½ feet) and makes his LED eyes and spikes light up and open and close his mouth and fires projectiles. Your child can also launch plastic boulders from his chest. This T-Rex comes with 3 warrior figurines with helmets, 4 boulders and 4 projectiles. There is even a built in jail. The T-Rex makes growling sounds. Recommended for children ages 3 through 8 years old, this T-Rex is sure to become one of your child’s best friends. He needs 4 AA batteries to operate. Smaller children will like that this dinosaur is close to their size, and older children really enjoy all the different things this dinosaur can do, making it a great toy that will grow with your child and hold their interest for years to come. It should be noted that this dinosaur is quite large and will take up a bit of space in your home. The Fisher Price Imaginext Ultra T-Rex is the perfect toy for any child who loves dinosaurs and feels that the bigger the better. Sure to provide your child with many hours of adventurous fun! 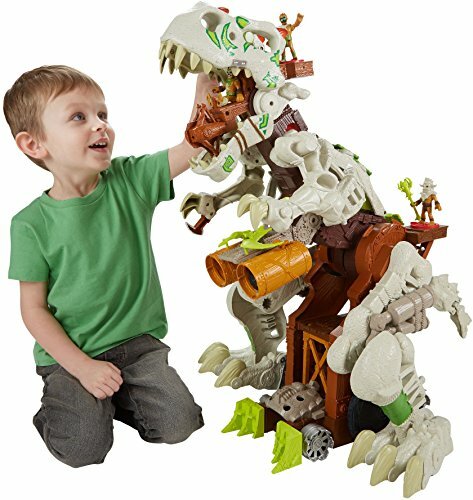 The Kidwerkz Dinosaur Construct And Play Kit is an awesome STEM toy that will encourage your little builder to explore the Jurassic World! Consisting of 106 pieces, this kit comes with 3 dinosaurs that your child can take apart and then put back together. It also includes 3 screw drivers, so your toddler has everything they need for dinosaur construction fun. The dinosaurs come fully assembled so that your child can play with them immediately and then take them apart to discover how they are made. The three dinosaurs included in this set are a 6 inch T-Rex, a 7 inch Alamosaurus, and a 4 inch Triceratops. There is also a bonus PDF coloring book that comes with this set. These take apart dinosaurs have a lot to offer your child in that they present in a fun way ways for your child to develop their fine motor skills, problem solving skills, and team work when working with others to put these dinosaurs together. This dinosaur kit will present your toddler with hours of fun whether using their imagination to create a dinosaur world, or learning how to use the screw drivers to take apart and put the dinosaurs back together again and again. This Kidwerkz dinosaur toy set is the perfect gift to encourage your child’s interest in building, using toys and using their creativity. 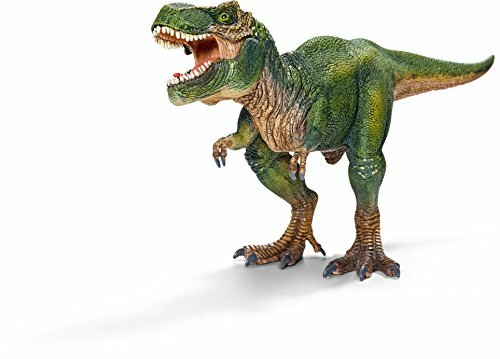 If your child loves using dinosaurs to engage in pretend play, the Schleich Tyrannosaurus Rexis sure to be a big hit and a great addition to their dinosaur collection! This awesome T-Rex stands about 6 inches high and looks every bit as ferocious as a T-Rex is supposed to look. Hand painted with very realistic details, his lower jaw moves to make this dinosaur even more fierce. Made from hard plastic, this Tyrannosaurus Rex is durable and recommended for children 3 years and up. He’s a perfect toy for the rough and tumble play toy of preschoolers. This simple dinosaur toy is sure to become a favorite of kids as they try and feed him grass, cheerios or whatever else they can think of. And it’s easy to see why he would become the king among your child’s dinosaur collection. He can be used to terrorize all those Little People or toy soldiers, trample those toy cars and trucks, and destroy those LEGO villages. There’s just no end to the imaginative play your child will enjoy with this T-Rex as his leading character! Kids think he’s lots of fun to play with! If you’re looking for a stuffed animal that’s different from the traditional teddy bear or bunny rabbit, check out this adorable Wild Republic Cuddlekin Triceratops. Cute and realistic looking, this baby dinosaur is extremely soft and has ultra plush stuffing making it perfect for cuddling and imaginative play. This delightful little Triceratops is gray and tan and has been designed to stand and sit up. It has friendly looking brown eyes and comes in either an 8 inch or 12 inch size. Sure to be a favorite bedside pal or the hit of your child’s tea party and play time, don’t be surprised if it’s carried around wherever your child goes. This cuddly baby dinosaur is great for pretend play, whether your little one imagines they are feeding it, rocking it to sleep, or teaching it how to make dinosaur sounds. 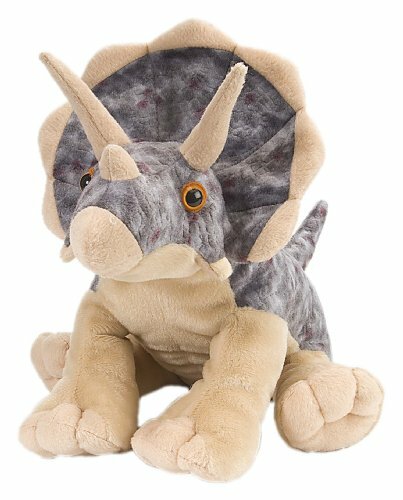 If your little one likes stuffed animals and is wild about dinosaurs, this Triceratops is the perfect for both boys and girls. Any small child who loves dinosaurs will love the Melissa & Doug Dinosaurs 4-in-1 Jigsaw puzzles! The set contains a puzzle of a Triceratops, an Apatosaurus, a Stegosaurus and a T-Rex. Each puzzle is brightly colored and consists of 12 pieces. Made entirely of wood, the back pieces of each puzzle are marked with a different symbol to make the puzzle pieces easy to sort if all the puzzles pieces get mixed up at some point. 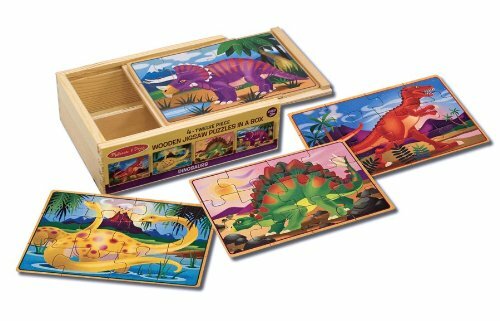 For convenience and easy storage, these Melissa And Doug dinosaur puzzles come in a divided wooden box with a space for each puzzle. The box has a space on top where your child can put the puzzle together. The wooden pieces of these puzzles are well made, great for small hands, and durable so your child can work these puzzles over and over again. Puzzles are great toys for small kids as they helps them develop fine motor skills, problem solving, and hand-eye coordination. With these puzzles, the symbols on the back of each puzzle piece can also be used to help improve your child’s sorting and matching skills. If you’re looking for a fun toy that will help your child reach various developmental goals, this set of 4 dinosaur puzzles may be the ideal gift. Kids think they’re lots of fun to solve! If your child loves collecting dinosaurs, this 72 Piece Mini Dinosaur Toy Set will thrill them! Made by ValeforToy, all the dinosaurs in this set are made from non-toxic plastic and run between two to four inches high. The colorful set comes with different types of dinosaurs, including the T-Rex, Triceratops, Pterosaur and more. These awesome mini dinosaurs will go perfect with a good dinosaur picture book where your child can match different dinosaurs to pictures in the book. They also make great cupcake toppers, stocking stuffers, piñata fillers, goodie bags, and prizes. The dinosaurs will allow your child to engage in hours of imaginative play by themselves or with friends or siblings, having dinosaur fights, or creating an entire dinosaur-themed world. While these dinosaurs are recommended for children ages 3+, parents bought them for younger kids who were beyond the stage of putting things into their mouths. Parents were also surprised at how detailed these dinosaurs are, given their small size. And many parents like that there are more than enough dinosaurs in this set for their child to play with friends and siblings. 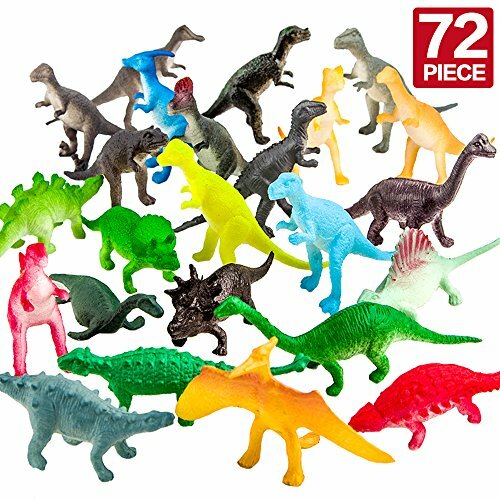 This set of 72 mini dinosaurs is great for any little dinosaur lover on your shopping list! The VTech Switch & Go Dinos – Tonn The Stegosaurus is a fun transforming toy that has 50 different sounds and phrases to keep your child’s imagination flowing. This Switch And Go is very easy to transform and has a cool LCD screen that shows dinosaurs eyes. By pushing a button, your child can switch between several different pairs of eyes. By pushing another button, your child will hear various sounds and fun phrases. According to one parent, Tonn’s voice sounds like a chilled out surfer dude. There’s also a button for volume control, which many parents really like. Children love both the dinosaur and car aspect of this toy and like making up pretend scenarios where Tonn turns from car to dinosaur while going on all kinds of adventures. In addition to Tonn, there are also other VTech Switch & Go Dinos that can be added to your child’s collection for even more transforming fun and excitement. Tonn requires two AA batteries (included), is recommended for kids 3 to 8 years old, and comes with an instruction book. This VTech Switch & Go dinosaur is a great way to encourage pretend play and helps develop your child’s fine motor and problem solving skills. Switch And Go Dinosaurs make great 2-in-1 toys for kids who love both dinosaurs and vehicles. Kids love transforming this toy from a dinosaur to a vehicle again and again! ToyVelt’s set of six Dinosaur Take Apart Toys With Tools makes for a great gift for any child who loves dinosaurs and has an interest in how things are built. The set includes two T Rexes, two Ceratops and two Brontosaurus dinosaurs. It also comes with two screwdrivers and two wrenches so your child has everything needed to take apart and rebuild these cute little dinosaurs again and again. These dinosaurs come fully assembled so your child can play with them right out of the box, or opt to take them apart and put them back together first. They also have interchangeable parts, which allow your child to enjoy a bit of creativity while learning to work with simple tools. 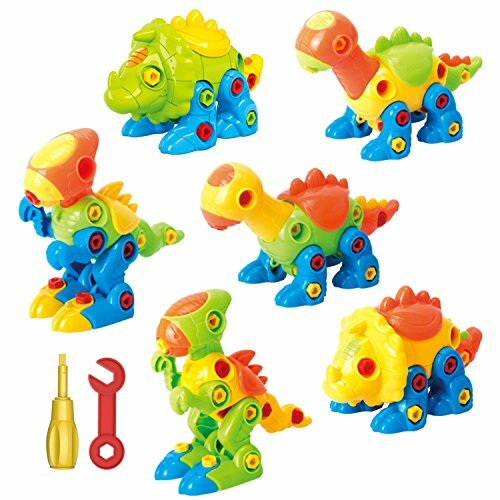 This set of dinosaurs is great for developing your child’s fine motor skills, problem solving skills and improving their hand-eye coordination. And with two of each type of dinosaur, your child can double the fun by sharing them friends or siblings. All of the dinosaurs are over 6 inches tall and at least 4 inches long and the set comes with a money back guarantee. 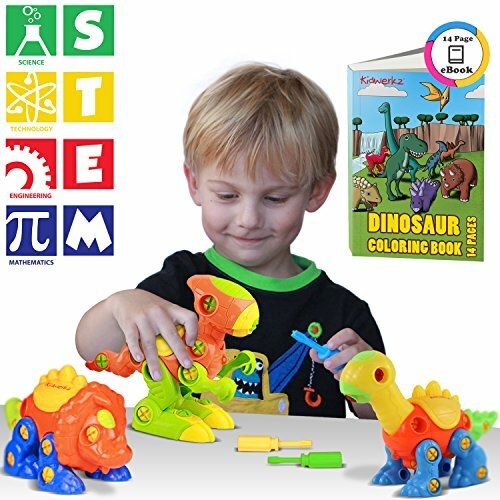 Designed for children ages 3 through 12, these take apart dinosaur toys will allow your child to have a great time both playing with and building dinosaurs. Based on main character of the popular Disney Movie, this Arlo The Good Dinosaur Large Figure is as cute as cute can be! 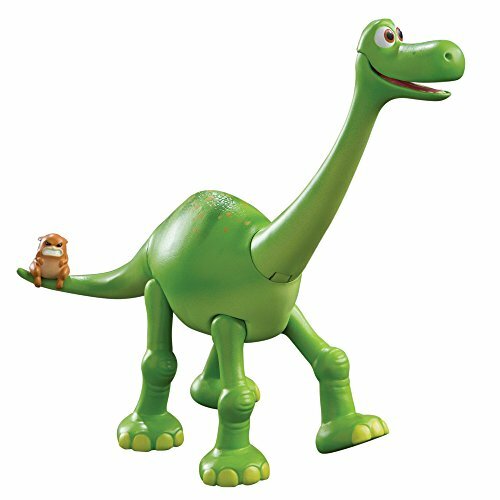 Arlo is an Apatosaurus who stands 7 inches tall and comes with posable legs, neck, jaws, and tail, as well as a little gopher figure. Your child will have lots of fun putting this adorable dinosaur in various poses, whether acting out scenes from the movie or making up their own pretend play scenarios. There are also other dinosaurs based on the movie that you can add to your child’s dinosaur collection for even more imaginative play. Parents do need to note that while the Arlo is the ideal size for small kids, the gopher he comes with may pose a choking hazard for children who still put things in their mouth. . If your child loves the movie “The Good Dinosaur” this Arlo figure will be a fun toy for them to play with. Kids love playing with Arlo! If you’ve got dinosaur lovers, they’ll be thrilled with Unipak’s Plush Dinosaur House With 5 Stuffed Animal Dinosaurs! All the baby dinosaurs that come with this cute little house are different, cute, cuddly, and machine washable. And getting five plush dinosaurs at once is definitely a great way to please your dinosaur loving little ones. Each baby dinosaur is about 6 inches tall and filled with pvc pellets to give them that bean-bag feel. They all have plastic eyes and their adorable plush house has windows for them to peek out of. The house is also a perfect way to keep all the dinosaurs together and it has a convenient carry handle, making it an easy toy to grab and go with. All of the dinosaurs are well made and the stitches hold up well, even to the rough play of toddlers and preschoolers. While these dinosaurs may not be very realistic looking, most children don’t seem mind and have no problem using them for imaginative play and cuddling. With 5 different dinosaurs, your child will enjoy making up all kinds of pretend play scenarios. This dinosaur house and its baby dinosaurs is also ideal to take to a friend’s house for a playdate or for carrying along to play with in a car or plane. This set is recommended for children ages 3 years and up. It should be noted that because of the pvc pellet filling and the potential for the dinosaurs’ eyes to come off, it’s not recommended for kids who are still putting things in their mouths. This plush house with stuffed animal dinosaurs is a wonderful toy for any boy or girl who loves dinosaurs. 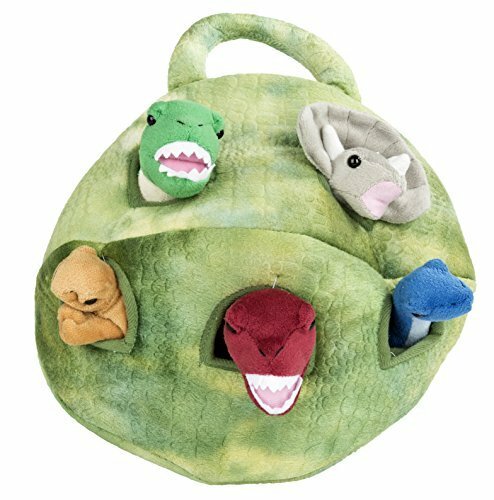 These cute little plush dinosaurs in their house are sure to provide your little one with hours of fun! The awesome Schleich Velociraptor makes an excellent addition to any dinosaur lovers collection! This Velociraptor stands about 3.5 inches tall and has a tail that’s about 3 inches long. He’s made from a solid plastic material that’s textured, giving his skin a more scaly, realistic feel, which kids love. He’s hand painted with lots of detail and has a cool movable jaw. Your child will really enjoy the hinged jaw because they can use it make the Velociraptor do fun things, such as bite other dinosaurs and eat things. This ferocious looking Velociraptor is able to withstand the rough and tumble play of toddlers and preschoolers, such as being dropped, or thrown. Your child will have loads of fun using him to engage in mock battles with other dinosaurs or toy figurines. Designed for children ages 3+, both kids and parents like the realistic look of this dinosaur. The dinosaur can be used alone or added to other dinosaurs as part of a collection. This Velociraptor is sure to become a favorite in your child’s dinosaur collection! 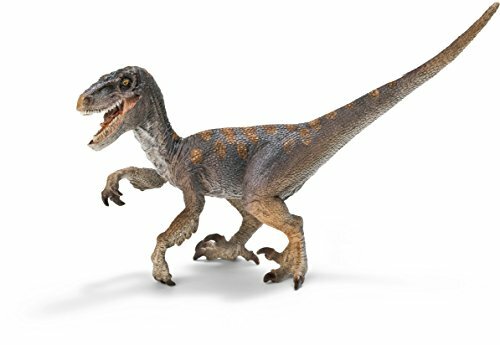 This Velociraptor is sure to provide your toddler or preschooler with hours of fun!